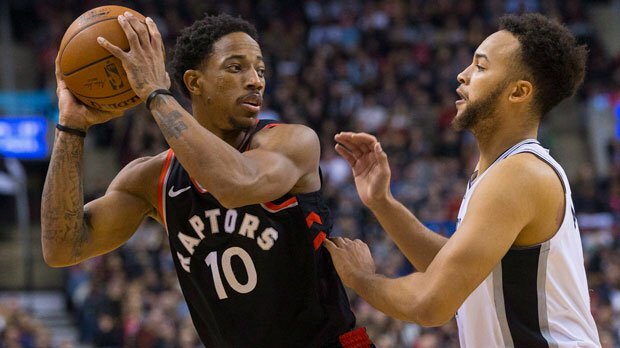 The Toronto Raptors are like many teams in the NBA in that they have struggled in recent years whenever they played the San Antonio Spurs. The struggle has been real enough for them to head into Friday night’s game against the Spurs having not beaten them in two years. But fate was on their side Friday night. San Antonio is capable of playing well no matter who they put on the court; it’s become sort of a hallmark for them over the years. But even they have their limits. Being down Kawhi Leonard, Rudy Gay, and Manu Ginobili didn’t hold them back against the Brooklyn Nets recently. But the Toronto Raptors are a much better team than the Nets. While the Spurs made them work for it, the Raptors were able to hold on for an 86-83 win, their first over the Spurs since 2015. It wasn’t a pretty win for the Raptors, but it was still a win. Neither team started off well. Toronto made just seven of their 23 shots in the first quarter, but the Spurs struggled just as much with shots and only led by one, 18-17. However, in the second quarter, Toronto was able to pick up the pace and hit 11 of 20 shots to take a 44-37 lead into halftime. The ugliness continued for the Spurs in the second half as they continued to struggle with their shots. Between their cold spell in the second quarter and the start of the third, they went close to eight minutes without a basket (16 missed shots). Toronto stretched the lead out to 14-points, 55-41, less than five minutes into the second half. But then the Spurs managed to flip a switch and get their offense on track. By the time the fourth quarter rolled around, the Spurs were only down by three, 63-60. San Antonio kept the game close in the fourth quarter, but with 2:39 left to play, Toronto had a nine-point lead, 80-71. Bryn Forbes made a 30-foot three-pointer with six seconds to play to cut the deficit to three points, 86-83. But San Antonio wouldn’t get another shot attempt. Kyle Lowry led all scorers with 24 points followed by DeMar DeRozan with 21. LaMarcus Aldridge led the Spurs with 17 points, including his 1000th point of the season. Final Score—Toronto 86 San Antonio 83. San Antonio has dealt with injuries to players all season long but has still played well enough with who they have to earn the third best record in the Western Conference. Higher seeds are always nice, but as long as the team is healthy come playoff time—the seed doesn’t really matter.